Indonesian online tourism platform signs MoUs with city and province on September 13 and 14. 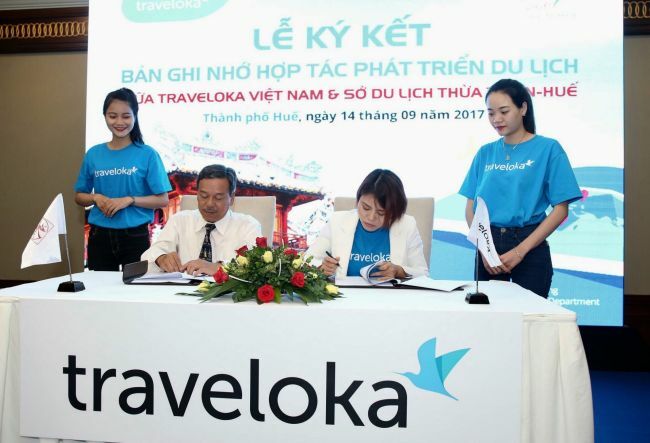 Traveloka, one of the leading online tourism platforms in Southeast Asia, announced it will cooperate with the Da Nang Tourism Promotion Center and the Thua Thien Hue Department of Tourism under memoranda of understanding (MoU) signed on September 13 and 14. The two local authorities will act as a supporting media sponsor for all programs from Traveloka on every promotion channel and advise it on how to promote travel destinations as well as introduce the local travel community to join in promotional videos about the city and province. Traveloka, meanwhile, will act to enhance the reputation and promote the local image of the city and province through online marketing activities. The two MoUs will help push the local travel industry to new heights, sharing sources of travel information and suggestions on top locations from Traveloka Vietnam, and enhance the two local travel industries. The moves also express the interest and needs of Traveloka Vietnam in cooperating with local cities and provinces that have great potential in tourism, working together in order to bring the best services to customers. “Through the agreements with Da Nang and Thua Thien Hue, Traveloka Vietnam agrees to increase links between promotional programs for accommodation in Da Nang and Hue,” Ms. Le Thi Thanh Van, Traveloka Vietnam Country Manager, told the signing ceremonies. She added that the good relationships with the two tourism authorities will help local businesses to thrive, increasing the number of tourists visiting Da Nang and Thua Thien Hue and booking rates on the Traveloka platform. Praised as one of the most desirable cities in Vietnam to live, Da Nang is also a major tourist destination. According to a report from the Da Nang Department of Tourism, in the first half of this year the total number of visitors was estimated at 3.3 million, an increase of 33.2 per cent year-on-year and representing 51.3 per cent of the annual target. Travel services in Thua Thien Hue have improved in terms of quality. It welcomed 1.7 million visitors in the first half of the year, up 1.9 per cent year-on-year, with revenue estimated at $76.3 million. Traveloka Vietnam is a leading flight and hotel booking platform in Southeast Asia. It is currently working with more than 100 airlines, providing information on more than 200,000 routes across Asia-Pacific and Europe, and 300,000 hotels in 28 countries, to deliver customers the best deals. It provides more than 40 payment options for customers in Indonesia, Thailand, Vietnam, Malaysia, Singapore and the Philippines, with 24/7 assistance from local customer service centers. Its mobile app has been downloaded more than 20 million times, making it the most popular travel booking app in the region.